Size: Please measure your heel to toe length and choose the accurate size from the foot measurements. About Ermonn: We are a professional wholesaler and exporter in China, we are committed to providing the best shopping experience and customer services. 【Features】Women's ankle booties. 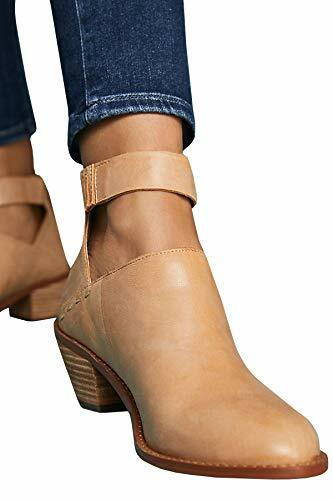 Cut out front/ Unique buckle strap/ Stitching/ Back zipper/ Pointed toe/ Chunky stacked heel shoes. 【Material】Faux leather. Comforatble fabric. It provides you with great wearing experience. 【Attention】Please check the Size Table in the description carefully before buying. 【Occasions】Casual/ Work/ Vacation/ Date/ Holiday/ School/ Shopping/ Outdoor etc. Fit for fall and winter perfectly. 【Ermonn】Registered trademark in the US. Many newest arrivals, please enter into Ermonn store and if you have any issue about this item, pls write your question in Customer Questions & Answers, we will reply to you sincerely. If you have any questions about this product by Ermonn, contact us by completing and submitting the form below. If you are looking for a specif part number, please include it with your message.